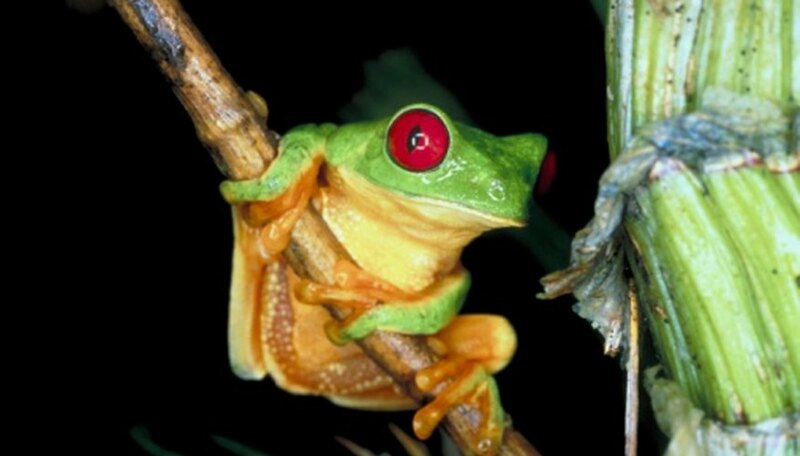 Tree frogs are iconic rain forest creatures that have bright red eyes and slick green bodies. The tree frog is a beautiful creature and a great example of adaptation and survival mechanisms. The bright colors of the tree frog startle its predators, giving the frog time to get away. Tree frogs are a popular topic for school projects, and the perfect accompaniment to any school project is a great visual aid. Create your own tree frog poster or cutout to make your school project memorable. View pictures of tree frogs online or in books to become familiar with their shape and coloration. Choose which species of tree frog you want to recreate. The most recognizable type of tree frog is the red-eyed tree frog which has bright red eyes and orange feet. White's tree frogs are slightly muted in their coloration and the common tree frog is brown. Print out the tree frog picture you want to work from and enlarge it using a photocopier. Mount the picture on a piece of foam board or poster board or draw a copy of the picture by hand onto the display board of your choice. If you draw your own picture, you will need to color it in using markers, crayons or paint. Leave your tree frog poster as is or cut out the shape. If you leave the picture on the poster board, display it in front of class as you present. If you cut out the picture of the tree frog, pass it around the class as you present so other students can view the tree frog up close. View pictures of tree frogs online or in a book and decide which type of tree frog you want to create a model of. If your project is about a specific type of tree frog, make a model of that type, but if your project is about tree frogs in general, simply select your favorite type or make a model of several different tree frogs. Mold the basic shape of the tree frog out of modeling clay. If you would like to paint your tree frog model after you finish it, use an non-dyed clay like air-dry clay that does not need to be fired in a kiln or oven. If you do not want to paint your completed model, use a dyed polymer clay. Add details to your tree frog models such as texture and finish. To mimic the porous texture of the tree frog's skin, press a piece of canvas or cheesecloth into the clay. Coat your finished model with a layer of clear gloss varnish to mimic the shiny, wet appearance of the tree frog. Fire your clay model in a kiln, oven or microwave according to the instructions included with the type of clay you selected. If your clay does not require firing, allow it adequate time to air dry completely. Display your tree frog models during your presentation by placing them in a rain forest diorama or by mounting them on a sheet of mat board. You may also mount the individual models to squares of mat board and pass them around the class for the other students to view during your presentation.